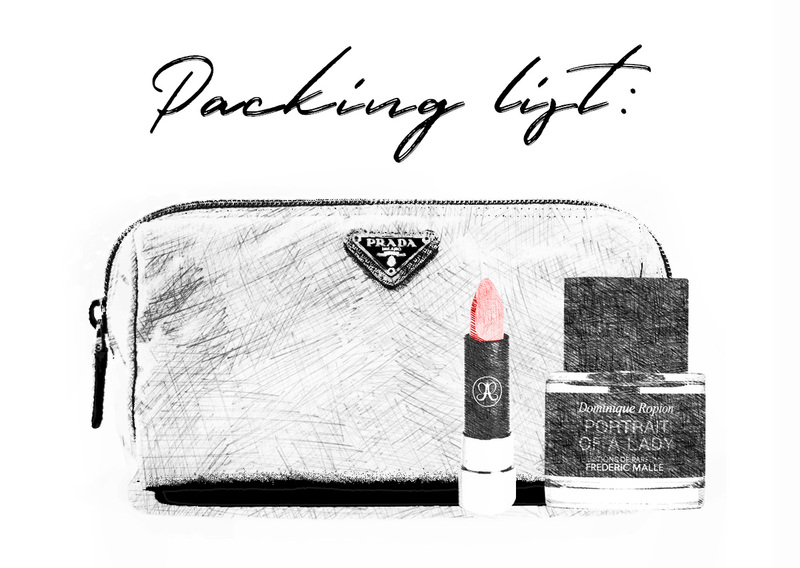 Since Anastasia Soare is always on the go, she has distilled packing and on-board primping to an art. 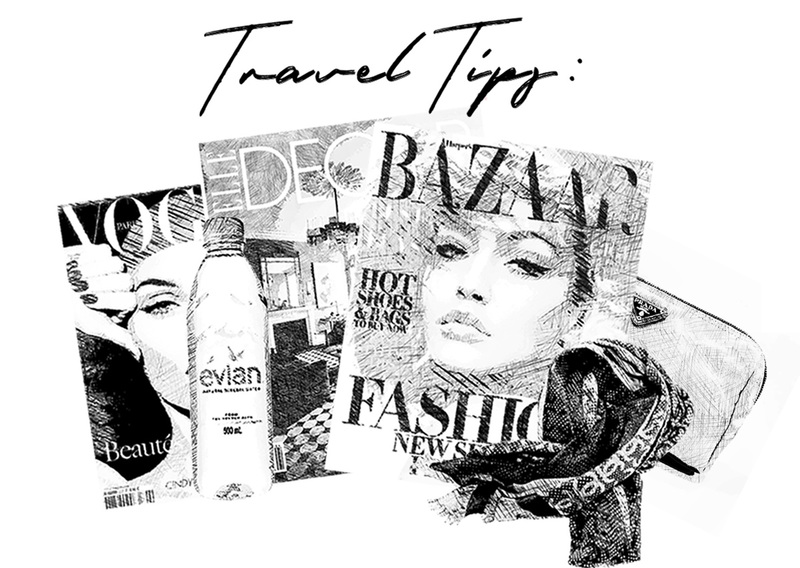 Having just returned from a week-long trip to Singapore, this seemed the perfect time to share her jet-setting rituals. Of course, I pack differently depending on how long my trip is. If I'm only going away for one or two days, I'll just bring a carry on, which involves a lot of planning. First of all, in my beauty bags, I have to have everything travel size, from eye cream, face cream, oils, shampoo, dry shampoo, hair spray, Marvis toothpaste, even travel-size perfume. I only use Portrait of a Lady by Frederic Malle. All of my makeup bags are the soft Prada ones; I like them because they aren't too heavy, and they can be molded to fit nicely into the suitcase. Inside I have our Anastasia Beverly Hills travel sized lipsticks, which I use a lot. For everything else, I pack as little as possible. I have a separate bag with mesh for my dresses that keeps them in perfect shape, and then I have my curling iron. Those are always packed first. Next, I put my shoes in shoe bags, and put them with my beauty products inside my Prada carry on. If it's more than a two-day trip, I have to get my Tumi bag, which is way bigger. I do this so often that I have it down to a science. I don't care if it's summer- no matter what the season I carry a coat with me and always have a cashmere scarf on hand because the air conditioning on the plane drives me crazy. Believe it or not, I even bring duct tape in my carry on, and I put it over the air conditioning vent because sometimes you cannot adjust the air and it wreaks havoc on my sinuses. I always buy a bottle of Fiji or Evian at the airport because I'm very picky about my water. I always buy my food from the restaurant. I hate the airplane food. You know, if you eat on the plane you get jet lagged, so I try to eat before I leave. I have snacks, like an apple or some trail mix or bars, but I don't like to eat a meal on the plane. I stock up on magazines, as I love to read. I like The Economist, I like Fast Company, and I will get Bazaar or Vogue just to look at the fashion, and then Architectural Digest and Elle Decor. The plane is also the only place I have time to watch TV and movies; I don't like to connect to the Internet. It's a nice break. I always have a tiny little jar in my bag with my eye cream or moisturizer, which I use once or twice depending on how long the flight is. I like to try new ones, but most recently I used Tatcha. I also use SkinCeuticals, and then our eye cream (a new formulation I'm tweaking), and face cream. And our oil, I'm obsessed with our oil. When I travel, sometimes the only thing I need is the oil. I decant it into a small jar because it's kind of heavy. I also always carry my tweezers, Brow Wiz, and a lip gloss, as well as a sample size shea butter hand cream from L'Occitane, it's the best. I keep it with me all the time, my hands get so dry on the plane. If I'm going directly to a meeting, I'll touch up my makeup about half an hour before we land. 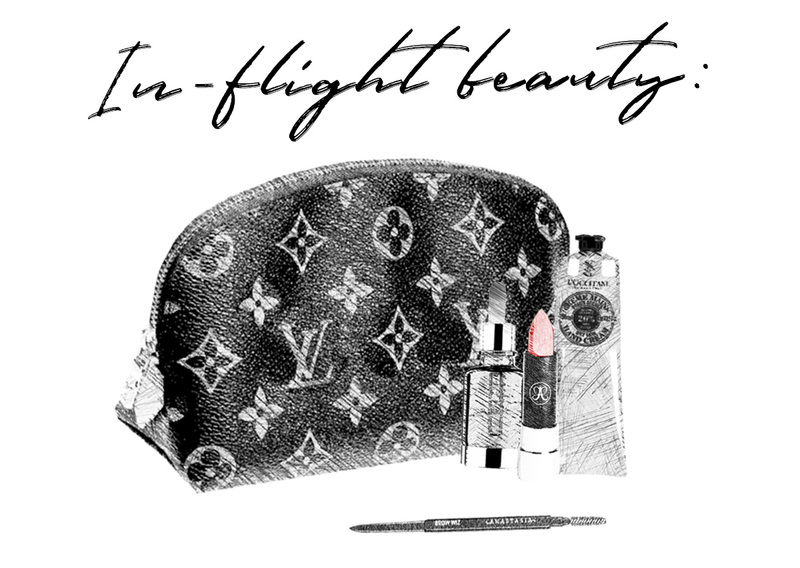 In that case I'll bring a small Louis Vuitton cosmetic bag with my initials that has all the products I need- bronzer, eyeshadow, brow products, lipstick, mascara, and a little highlighter- that's the final touch. I'm very lucky that I don't need to do anything to my hair. It never gets messy. Never. Sometimes I don't even need to brush my hair. It's the weirdest thing.